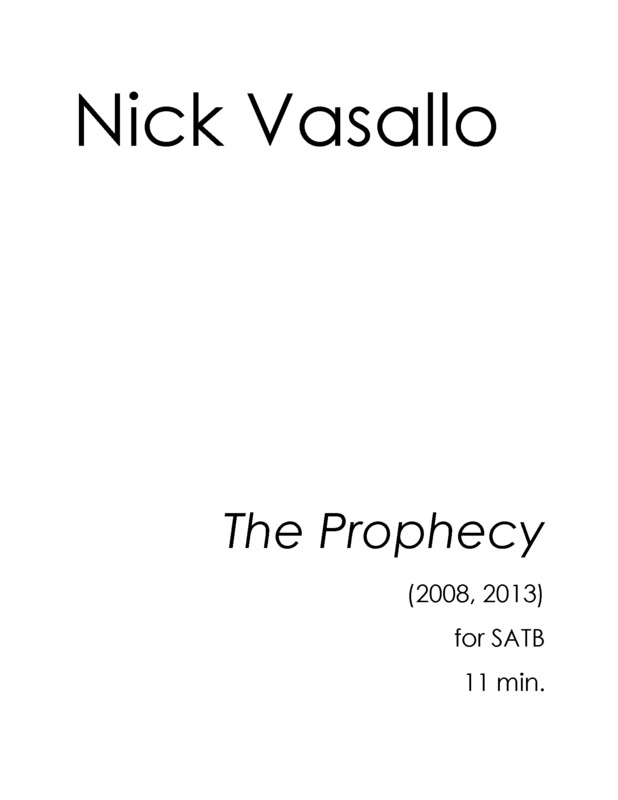 The Prophecy (2008, 2013) 11 min. for SATB, baritone, and organ. Premiere: November 15, 2013 at Washington State University, Bryan Hall Theatre. A setting of two passages from The Book of Ezekiel (7:3-7:4). Here is a final message of doom upon the whole land; the judgment is inevitable and close at hand; social relations will be broken up; preparations will be of no avail; wealth misused for idolatry and luxury will become the spoil of the heathen; priests, prophets, king and nobles will be helpless to deliver; the Temple will be profaned, and the remnant shall be overwhelmed with sorrow. Each movement was composed 5 years apart.